Home / Blog / IT Staffing / How Much Does It Cost to Hire SASS Developer in Ukraine? How Much Does It Cost to Hire SASS Developer in Ukraine? With the standards for websites having evolved to immersive experience, responsiveness, and aesthetics, coding CSS have become challenging, repetitive, and time consuming. In order to address this, Hampton Catlin, Natalie Weizenbaum, and Chris Eppstein designed and developed CSS preprocessor SASS, or Syntactically Awesome Stylesheet. The name itself has character, which speaks for the language itself. CSS preprocessor are scripting code that is designed and developed to extend CSS, then compiling the code into regular CSS. Obviously, CSS programmers get a lot of privileges using SASS, as it gives SASS developers the advantage of coding the style for your webpages with cleaner code that is complete with reusable functions and variables, shorter coding timeframes, manageable code maintenance, easy setup, and better organized code. According to the 2016 Front End Tooling Survey, SASS is the top CSS preprocessor of choice and is found to have the highest knowledge and comfortability level by the majority of developers. The graph below shows the interest in SASS programming, over the past 12 months. 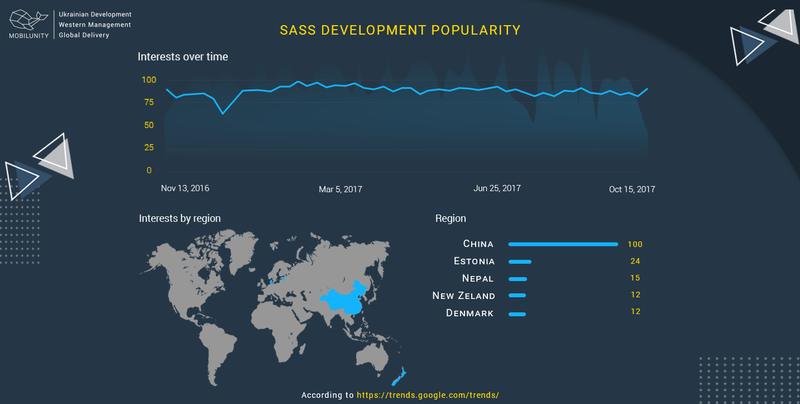 According to Google Trends, China shows to have the most interest in SASS developers. SASS as well as LESS is preferable to have for frontend developers in set of HTML and CSS knowledge. That’s why, based on my experience, there are no requests for hiring of SASS developers for a particular project. Variables – where features like color, size, any CSS value can be temporarily stored are used and reused as the code is executed. Operators – SASS provides the capability to build and navigate the styling of your webpages with logic and math operators. Mixins – similar to variables, mixins provides the ability to group together CSS declarations to be used and reused throughout the code. Extend/Inheritance – SASS provides developers the ability to declare a set of CSS properties or features and have that set be shared or extended throughout the rest of the code. If you need to hire a person with SASS developer CV, you should determine skills, necessary for your project. Skill stack mostly depends on the type of the project, ideas you would like to implement, people you would like to hire. If you want just one coder, it should be a person, proficient in many fields. Such a professional will be able to make everything you need for your website. The other option is to hire a dedicated team of professionals. You will get a set of experts, who will work as a team to achieve an outstanding result. But what is must-know for the developers? We have picked the most popular requirements for the SASS engineer CV holders. Ability to craft modular, clean and structured SASS and HTML code, based on wireframes and UI designs. Ability to work on large scale websites. Familiarity with tools and workflows for the large code bases. Ability to refactor and streamline SASS, making the code maintainable, using naming conventions, modular organization, and DRY principles. Building and maintaining live style guides. A capability of implementing wireframes, provided by the designers, presence of a good UI design sense. Expertise in creation of the responsive styles, able to render well on the screens of different sizes. Knowledge of the cross-browser testing, ability to create a product, which works well in different browsers and their versions. Knowledge of Mac terminal and command line. Ability to use Git and Github, the experience of work in a team at the projects, using Git. Ability to collaborate with the developers, visual designers, product managers. HTML. The first thing to learn, when a person wants to get started with web development. The standard markup language is obligatory for the coder who creates web pages. The latest version is HTML 5. CSS. A thing, which helps your HTML pages to look beautiful. With it, coder gets the ability to add colors, size buttons, work with background images. It makes a lot for the responsiveness of your website on mobile and desktop devices. SASS is one of the CSS preprocessors, enhancing it with more functionality. JS frameworks and libraries. Ready patterns and the best practices from the professional coders make the development process easier and faster. A person, who has it in the SASS programmer resume, can create complex applications with the efficient user interface, which is easy to maintain. The popular options are React, Angular, Vue. Want to hire a professional right now? You can make it here. We have an example of SASS programmer resume for you. Check the skills and experience of our specialists and find the best performer for your project. filling the website with content. experience of the cross-browser layout of the complex designs. The skilled coders are not cheap, especially if you have a project for a long period of time. Luckily, you have a really great choice. You have access to the world’s pool of talents, where you find the same high quality for lower SASS salary. Ukraine is one of the most popular outsourcing destinations in Europe. 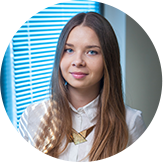 Ukrainian developers offer the products of high quality, which cost lower. Hiring the remote performers for your project, you significantly save costs. Let’s compare the SASS coder salary in different countries to find the most cost-effective option. The USA. in the United States, the average salary for SASS developer is $83,000 per year. The junior specialists start with $71,000, while the senior ones earn up to $116,000 in a year. The UK. In Great Britain, the average salary rate for the coder is £30,000 per year, which is about $39,953. The average additional compensation reaches £1,250 of bonus + £1,850 of profit sharing per year. Germany. The average SASS programmer salary is €44,557 in a year, which is about $50,547. The minimum in the country is €30,000, and the maximal rate is €60,000. Switzerland. SASS engineer salary is on average CHF 84,000 in a year, which is about $83,865. The salary for this position ranges from CHF 29,000 to CHF 124,000. Ukraine. In Ukraine average SASS programmer salary is on the level of $22,392. It ranges from $12,000 to $41,000, depending on the coder’s skills. Geography is not the only consideration when thinking of the hiring and SASS developer cost, their salary also vary depending on the number of years of experience that the web developer SASS has. It should also be noted that another consideration should be given to the complexity of the project as well as the amount of experience that the SASS programmer has. Demand of SASS developers is not that high. Technology is very simple and lots of people can master it in a short period of time, thus there are not so many requests to look for SASS developers. However, with our huge experience of recruiting, we are ready to provide a talented Ukrainian SASS programmer. How Do I Hire a SASS Developer? Today’s technology and connectivity provides you with various avenues and options on hiring SASS developers, the more traditional route of hiring locally and in-person, and the more modern approach of remote hiring are the two major ways in hiring SASS programmers. Traditional hiring focuses mainly on the geography of resources; hiring locally or within transport distance. Hiring locally provides you with the advantage of being more personally involved in the frontend development of your web development project as well as have personal interaction with the SASS developers that you have hired. The second option utilizes the method of hiring remotely, or offsite. To hire SASS engineer remotely who utilizes globalization and people’s ability to communicate with people from all over the world is the new normal. With the wide reach of today’s connectivity, looking for and hiring SASS developers have become more convenient. To hire SASS coder for project remotely provides you with the opportunity to get in touch with a diverse range of skilled and experienced developers as well as more options on the cost of hiring such programmers. Remote hiring comes with a lot of options as well, one of them is the ability to hire SASS developers teams that would collaborate with you on your projects. Hiring a dedicated team of SASS developers gives you the opportunity to work alongside professional developers that are focused in creating and improving your web development project with you. Our company, Mobilunity, are able to provide you with skilled and experienced SASS developers that are more than capable of addressing the tasks that you are interested in outsourcing as well as providing you with a dedicated team of highly recommended and vetted SASS developers that with collaborate with you to ensure the highest quality of results. Why Should I Hire a SASS Developer? With the standards for quality websites being set high, with focus on user experience, responsiveness, and optimal resource utilization, the market for skilled and experienced SASS developer is competitive. SASS is the leading CSS preprocessor in the market, and with this great tool, SASS developers have the advantage of being knowledgeable and skilled in creating with this great tool. If you are interested in outsourcing your projects and hiring to an offsite dedicated team to improve or integrate SASS into your web development project, our company, Mobilunity, can provide you with what you are looking for! From their pool of skilled and experienced SASS coders and SASS developers, Mobilunity can provide you with professional developers that have been vetted and are highly recommended. To hire SASS developer from Mobilunity assures you quality output at a manageable cost! Mobilunity is a highly appreciated and respected dedicated development teams provider companies in the IT community. Founded in 2010, Mobilunity has been providing talented developers to various countries worldwide. As on 2017 year end, we have 4 teams working on Swiss projects, 3 teams for our German clients and 2 teams for customers from Canada. Our business development team gets nearly 15 requests monthly to solve different types of tech issues and we are delighted to help them out. We think that trust and respect of our clients is the main key to achieve success in business. We are always ready to meet new challenges, so no matter how complicated your project is, we can find the best solution for you in no time. Still hesitating where to hire developers? Make a right choice with Mobilunity! Mobilunity can provide you with the highly recommended and highly dedicated team of SASS developers! How Much Does Big Data Development Cost?